Staying organized can be difficult when you’ve got a lot of things on your plate. Whether it’s planning and keeping track of a home remodeling project or figuring out what’s for dinner, I’m often amazed at the amount of details we try to keep stored in our heads. Not surprisingly, some details slip through the cracks – like when I forgot to get baking soda for last night’s chocolate chip cookies. Included with the latest version of Microsoft Office Home and Business 2010, Microsoft OneNote is a wonderful program that helps us organize all our projects, recipes, and ideas in one place. While I’ve been a Microsoft Office user for several years, this was the first time I had the opportunity to try Microsoft OneNote. OneNote is pitched as a program that will help you to stay organized with all of the different projects we take on through the year – from planning a family vacation to keeping a nutrition journal. Included with Microsoft Office Home and Business 2010, OneNote is easy to use right out of the proverbial box (or download, these days.) It includes pre-made templates and planners for many of the common projects, enabling you to just click a button and get started. Once created, OneNote guided me in easy to follow steps to help fill out my planner. I started off with Before & After photos, making sure to include notes for some of the items that needed to be changed. Using the “Draw” tab, I’m able to draw custom shapes and arrows, add text, or highlight items that are important. OneNote has an colorful toolbar at the top of each notebook that allows you to navigate to each section. The DIY Home Remodel Notebook has tabs for Before and After, Research, Buget, Calendar, To Do, and Contractors. There’s also a guide option at the end. I use Excel for most of my tracking, so I could really appreciate the Budget tab. On this page, you can list out all of the costs for your project and note anything important. Even better is that you can do basic math calculations, so I won’t need to jump from one program to another to keep track of the finances. I think one of my favorite features of OneNote is the ability to share the notebook with others. 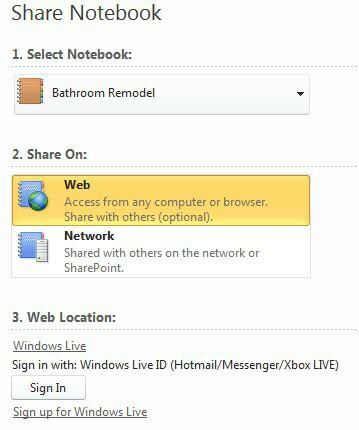 You can enable the share feature for each project, allowing other people to log-in to view your notebook. This is a great way to keep in touch with contractors, ensuring that everyone is on the same page and that budgets are on track. The calendar tab is another great way to make sure that deadlines and scheduling are accurate and on time. 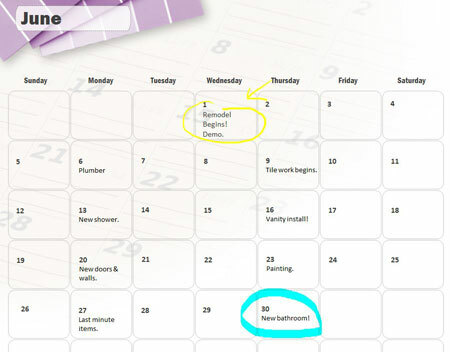 Microsoft OneNote makes it so much easier to keep track of remodel projects. It is easy to use and everything is all in one place for everyone to review. You can capture screenshots of other rooms or projects for inspiration and keep track of things on your to-do list. And it’s not just for remodel projects. You can also use it to keep track of your favorite recipes, planning trips, or even your fitness plan. There are over a hundred different project templates available for download that you can use to help you stay organized. If you’d like to take Microsoft OneNote, and the latest version of Microsoft Office Home and Business 2010, out for a spin, you can visit the Microsoft website to download a 60-day free trial. You can also purchase the whole kit and kaboodle on Amazon for just $151.63. 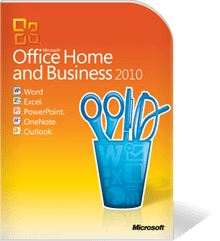 One winner will receive a copy of Microsoft Office Home and Business 2010. I would use One note to keep the family budget straight and keeping my diet going [email protected]!! I would use it to keep the familys budget and keep my diet going strong! I would use this for my upcoming laundry room remodel….as well as many other daily projects that I have going on. Sounds like a great new feature & I would love to be able to use it. Thanks for the giveaway. I would use this awesome gift for many things, like making flyer s for my b/f wood shop, for keep up with the business, organizing files and I love creating beautiful calenders. Fingers cross and hope to win. This software would be handy for my genealogy projects. I would use it for my bathroom renovation! Would greatly appreciate winning a copy of Microsoft Home and Office to keep track of many areas of my life…diet, money, and several home renovations, to name a few. Thanks for a great opportunity to win a great product. I would use One note to help with my mom’s business. I would use it to help organize my meetings at work. I would use it to keep track of my work (I work from home and need to keep track of phone contacts, appointments made, etc. What a cool product!! Probably blog contests I enter. That would be great for Relay for Life planning! I would use it to become more organized in the home and our finaces and also to prepare documents for our church! I would use it to keep school projects on track. I go to University and homeschool my daughter and granddaughter. I am also dieting using the 1500 cals per day plan from my dr. Drs appoinments….sounds like it has the capability to keep up with me and my little ones. Right now I use the Note pad that came with the computer and have tones of little icons everywhere. This would make things go so much smoother for us and keep everything in one place. Thanks for the opportunity! My husband is a contractor so we would use this for all his building projects. I would use One Note for keeping my family on schedule, our bill paying on schedule and work deadlines organized. It would be great for organizing our kids sports schedules. It would make it easier to figure out who needs to take them and pick them up from practices. This would be so helpful to have when planning all the different family gatherings. I would use it to keep everyone informed of all the various doctor and dentist appointments along with school and church activities that occur during the month. I am currently organizing a fundraider. One Note would be a great way to keep me organized. I would use it to organize everything with my two blogs! It would help with with lots of sports schedules for my kids and a new partime job I am starting. I would use it to help organize my house – my bathroom and kitchen needs the most help! I would use it to track my home budget as well as keep track of my boyfriend’s business. I would use all of Microsoft features to keep my busy life including work, nursing school and managing a house with 4 year old toddler as organized and on track as possible. Thanks for the giveaway! i would use it to organize my house and car maintenance. I am currently taking classes and OneNote would help me organize class work, labs and homework. The better question would be what wouldn’t I use One note for! The possibilities are endless! From keeping track of my work schedule to my kids sports schedules, to all the aspects of my busy life and maybe would help me encourage my husband to do some much needed remodeling around the house! Would LOVE to win this!!! Thanks! I’d use it for my budget! I’d use it to help me with my budget! To help keep track of appointments and things I do on here. I would use it to track all our family appointments. As a teacher and a returning student this can be so useful to track every aspect of my busy life. I’d like to keep track of all of the lessons/projects/outings for my son! I would use it to organize contests I enter, blogs giveaway and blogging jobs and anything else that I have post-its and tear outs for. It would help e keep track of my work meetings. I’d use it for every day events. Parties, school activities, doctor appts. etc. I’d use it for keeping track of my Mom’s doctors’ appointments, various deadlines that I have at work, new book releases…..the possibilities are endless! We have a lot of projects to get done around the house, so I think it would be a big help with that. I would give this to my husband to track his appointments. My husbands Meds and Appts. I am the church historian for my local church so this is a very big project that has to be turned in to the central church. I would try to write out all of the things our family is up to so I could stay on track of it all. Everything! Im normally working on several projects especially for my travel business. Would be great to have everything in one place. I would use it for appointments. We are in the process of arranging an out-of-state move, and my house is a federal disaster zone (has been for years). I’d use OneNote to help me organize everything for the move, from setting up a cleaning schedule to packing what we need and getting rid of what we don’t. I would use it to keep track of birthdates/anniversaries. I would use this to keep track of our homeschool projects. It would be perfect for the kids yearly portfolios. I’d use it to help with decorating our new home. 5 Boyz in sports… appts! I’ll bet it would more easily help me stay on task with my blog posts! To keep track of bills and birthdays. Keeping on track for writing assignments. I would use it for trips, appointments and anything else that I have to do. I love lists and have a busy young family so need to create them. It was also help me create budgets that I could try to stick to. I really need Office for my schoolwork. I would also use it for stuff at home, too. Keeping track of finances, kids’ activities, and my schedule just to name a few. I would really get a lot of use from it! Thanks for a great review! I love how you used it! I’d use it to keep track of my son’s scheduling. It’s a hot mess! I would use excel so that I can keep track of my book sales. I’d use it to plan a move. Getting our various acts together all long overdue. We have several home businesses and a 3-flat – and the various sources of income and expenses are a real challenge to keep organized and a nightmare at tax time. We are also dealing with (battling) cancer and we need a way to keep track of all the treatments, doctors, expenses, research etc. Sev different ways…. we just bought a house so it will help with all the remodeling we will be doing also it will help with our Construction/ Plumbing company…. It could be used in many ways for our construction/excavating business. I’d use One Note to keep track of my student’s assignments. I’d use it to keep track of my mum’s bills, appointments and activities now that she’s getting a bit forgetful. I would use it to keep track of my training for my 5K. I would like to start a business plan. I would use this to keep track of my ATV trips and our household budget. I would track my kid’s homework! I would use it, to finally get the Ebay room finished/online store. Would be nice. I could use it for organizing homeschool projects and happenings. I work from home, so this would be great for helping me keep track of the timelines on scheduling events. Redoing my living room and keeping up at university! I’m a “back after a 15 year break” college student. A new Office program with OneNote would be absolutely perfect for me! I could use it for everything from school projects to home improvements to planing my son’s homeschooling. I would use it to keep track of my homeschooling projects and also my storage area so I know what I have! Create budgets, schedules, food menu, bills, homework, project assignments, birthdays, & ect. Need this major update for my new Mac! I’d use OneNote to document tearing off our 1970’s era deck and replacing it with a low maintenance patio. Keeping track of reviews! LOL. I would use it to keep track of a bunch of stuff – my job search, my blog reviews, my upcoming wedding stuff! I would use it to keep track of my family finances. Would make being a home-school mom so much easier! Getting and keeping on track our personal and my business finances. Also, we are trying to buy a house so to stay organized with that as well. Working on my blankets, getting the patterns right and right colors. I have a kitchen remodeling project that requires organization. I think it would help me clearly lay out a plan, organize all the details, and stay on track with preparing for our upcoming garage sale without becoming overwhelmed and waiting until the last minute to do everything. I would use it to help keep up with my school work! Keeping up with the family schedule! would help my wife with her dog show things. We use it for our homeschooling – I love it! I would use OneNote to organize my construction projects that I’m working on. I’ll use OneNote for meal planning and shopping. I’m starting back to school soon. I will need help organizing and staying on track with that. I’d use Microsoft OneNote to make an easy to follow family schedule. I know OneNote would save my family alot of time, since we’re usually scattered taking-on school, work, and after-school activities. I would use it to keep track of my household budget. I use Excel to monitor my rental properties. We are remodeling our bathroom and this would be awesome to keep track of expenses and ideas and well everything! I would use it to keep all of my kids things such as activities and work together. I would use it to budget, to use it to remodel my closets. monthly upkeep of my house. We are residing out home and it has been interesting. , new windows, old windows new storms or old windows repainted old storms, wrapping, and cost comparisons. Yes i think we could use this program. I would use it for work schedules and other documents I use there. Keeping the finances and bills organized. Keeping the family organized on bills, trips, events, etc. I have many family pictures and groups to keep track of . Family schedule and keep track of notes for a book. 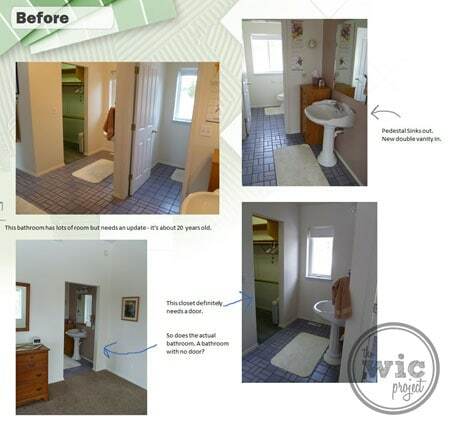 School work and a bathroom remodeling project. We’ve got a garage sale planned for the end of August and I’d love to be able to catalog and price things as well as organize and prep for the sale and post advertisements in a logical and organized fashion. I would use it for meal planning. I would use this for our little league records. I would use it for my book reads and further follow up notes. it would help me stay organized. if i dont have things written down they do not get done and calendar just isnt cutting it. if i have things written in front of me i am more likely to do them… like washing clothes or calling my mom. haha. I would use it for my workouts. I would use it for keeping track of my records for various things. I would use it to keep track of winnings of sweepstakes (for taxes) and other various things. I have a small web management business and it would be nice to have this to track some purchases. I would use it on my amazon business, i think it would help alot! I would use it to help keep track of items I sell on ebay and Amazon. my wife’s new business and our finances. trying to save to buy a house. I’d use it to keep track of my husband’s storage locker. I have no idea what is in there and half the time he doesn’t either. I’d use it to keep track of project budgets – how much I spend per room. I am actually doing a rehab on our 90 plus year old home and it would be perfect for that! OneNote would be great to coordinate not only my projects at work, but home projects, kids’ activities and my coursework. Pretty simple, my college classes. I would keep my stories organized. My writing is currently organized by scribbles on the back of receipts or in notebooks. I would use it for my running routine. I’d use it to keep track of the books I’ve read and ones I want to read. Hello, how are you? Thank you for this opportunity. I will use Microsoft’s One-Note to organize my class lectures. I would use it to finally organize my coupons. I would use it for my husband’s lawn service. I have never used One Note and after reading what you wrote, I think this would be a great way to keep track of my backyard landscaping and remodel. I would use it for my couponing. I would use it for rescue work. This would be helpful for keeping track of my appointments and expenses. I would use it for my blog to keep track of product reviews & giveaways. To keep track of things in my storage. I would keep track of the kids appointments and practices. I would use the calendar. I would use it to keep track of my appointments and expenses. I am putting together an art project for a fundraiser in the area. I would use it for that! Ghee, we could be very organize for our home office, home projects and school.